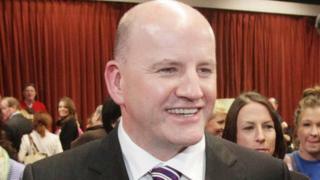 Sean Gallagher, a former judge on the Irish version of Dragons' Den, will be on the ballot paper for the upcoming Irish presidential election. Mr Gallagher secured the required four nominations of Leitrim, Roscommon, Mayo and Wexford county councils. The businessman came second in the last presidential election in 2011. He will face the incumbent president Michael D Higgins, who has indicated he will run again and who has the support of several political parties. Independent Senator Joan Freeman has also secured a nomination to contest the election. She said that Mr Higgins had "brought a dignity to this country" but "we are in a very different place and time now". "As president, I believe I can influence change," she added. Mr Higgins is backed by the ruling Fine Gael, the main opposition Fianna Fail and the Labour Party, of which he is a member. The 77-year-old former trade unionist was elected in 2011 for a seven-year term. Following his fourth endorsement, Mr Gallagher said on Twitter that he had asked Fingal Council to withdraw his name from the list for consideration to make way for other candidates. Sinn Féin is due to announce its candidate for the race on 16 September. Other candidates seeking support for election include businessman and current Dragons' Den judge Gavin Duffy, who is backed by two councils. A number of other prospective candidates, including journalist Gemma O'Doherty, have been appearing before councils. In 2013, Mr Gallagher took legal proceedings against national broadcaster RTÉ over a tweet that was read out in the final TV debate before the presidential election. Mr Gallagher claimed the Frontline programme involving the election candidates was deliberately and unfairly edited, presented and directed by RTÉ to damage his electoral prospects. He claimed for damages, including exemplary damages arising from comments made by broadcaster Pat Kenny. RTÉ had denied Mr Gallagher's claims, but subsequently apologised to him and paid a substantial settlement.